This is the second part in our “Ad Blocker Strategies” series of articles. In this part, we review the next two strategies publishers have adopted and the broader industry response to ad blocking. You can find the first part here and the third part here. The first part of our series concluded with a discussion about the “Block the blockers” strategy. Up next is the “Engagement” strategy. The basic premise of this strategy is that publishers are better served having a conversation with their visitors about the impact ad blocking has on their businesses; what their visitors’ concerns are and what publishers can do to mitigate visitors’ concerns while maintaining acceptable revenue streams. A number of prominent publishers have adopted this strategy and include the Washington Post, The Guardian and Ars Technica. The Washington Post straddled the “Block the blockers” and “Engagement” strategies. Buzzfeed reported on experiments to persuade visitors to subscribe to The Washington Post in its article titled “Washington Post Declares War On Ad Blockers”. It began prompting visitors to subscribe to the site intermittently. One of the articles it tested this tactic with was its article about the discovery of a new humanoid species, Homo Naledi. The Washington Post gave ad blocker-using readers who tried to view this article various subscription options after first pointing out that the visitor’s “ad blocker’s on” and cautioned him not to “block out great journalism” and to subscribe. I tried accessing The Washington Post using Firefox’s enhanced Private Browsing mode which, essentially, turns your Firefox browser into an ad blocker but didn’t encounter any warnings. Buzzfeed mentioned that The Washington Post’s tests were focused on a particular ad blocker so it will be interesting to see how The Washington Post approaches ad blocking going forward. The details are still being hammered out, but the aim is to provide an alternative to the approaches taken so far by various publishers, which give people two options: pay up or put up with the ads in their current form. The Guardian is trying a third way that “puts the user in control,” according to the publisher’s global revenue director Tim Gentry. “Offering a customized ad experience is an area I’m most interested in, and one in which we’ve yet to experiment. I don’t know how we do it, or how exactly it will work yet because it’s that early, but it’s a fascinating area to explore,” he said. Did you know that blocking ads truly hurts the websites you visit? We recently learned that many of our readers did not know this, so I’m going to explain why. My argument is simple: blocking ads can be devastating to the sites you love. I am not making an argument that blocking ads is a form of stealing, or is immoral, or unethical, or makes someone the son of the devil. It can result in people losing their jobs, it can result in less content on any given site, and it definitely can affect the quality of content. It can also put sites into a real advertising death spin. As ad revenues go down, many sites are lured into running advertising of a truly questionable nature. We’ve all seen it happen. I am very proud of the fact that we routinely talk to you guys in our feedback forum about the quality of our ads. I have proven over 12 years that we will fight on the behalf of readers whenever we can. Does that mean that there are the occasional intrusive ads, expanding this way and that? Yes, sometimes we have to accept those ads. But any of you reading this site for any significant period of time know that these are few and far between. We turn down offers every month for advertising like that out of respect for you guys. We simply ask that you return the favor and not block ads. What I like about the Ars model is that although casual visitors to the site can read articles in full, although ad supported, subscribers receive real value for a very reasonable $5 a month. These benefits include no ads on the website when logged in; full RSS feeds (wonderful for people who still use RSS/feed readers like me) and downloads of Ars’ terrific and in-depth reports in multiple formats to suit your device preferences. We get it. Many of you really hate online advertising. And, indeed, there’s often a good reason for that. The ads can be irrelevant, intrusive and annoying. And, in some cases, they can even be dangerous, as scammers or those with malicious intent slip bad code into ad networks in order to wreak havoc on visitors’ computers. So here’s a deal: if you don’t want to see display/banner ads on Techdirt any more you don’t need to. Just go to your preferences page (whether you have an account or are just browsing without a login) and click the button saying you want to disable ads. And, that’s it. No more network display ads. This isn’t one of those “pay us to remove ads” deals. It’s up to you. That said, obviously if you disable ads we’re likely to make less money. So if you choose to do that, we’d appreciate it if you supported us in other ways, such as via our Insider Shop, where you can buy a membership that gets you certain perks, or through our Deals Store, where you can support Techdirt while buying some cool products and services. But, again, this is not a requirement. If you don’t like ads on the site, turn them off. Instead, Techdirt’s approach is to offer multiple options to the community on the assumption that fans of the site will want to support it and will either permit ads or take advantage of Techdirt’s other monetization options. It is certainly a bold approach but the assumption that your fans will want to support you has a fair amount of support in various industries. The industry made an astonishing series of admissions that it had caused many of the difficulties that now face it through its representative, the iab. The iab outlined its response to ad blocking in a blog post titled “Getting LEAN with Digital Ad UX”, beginning a bold admission. 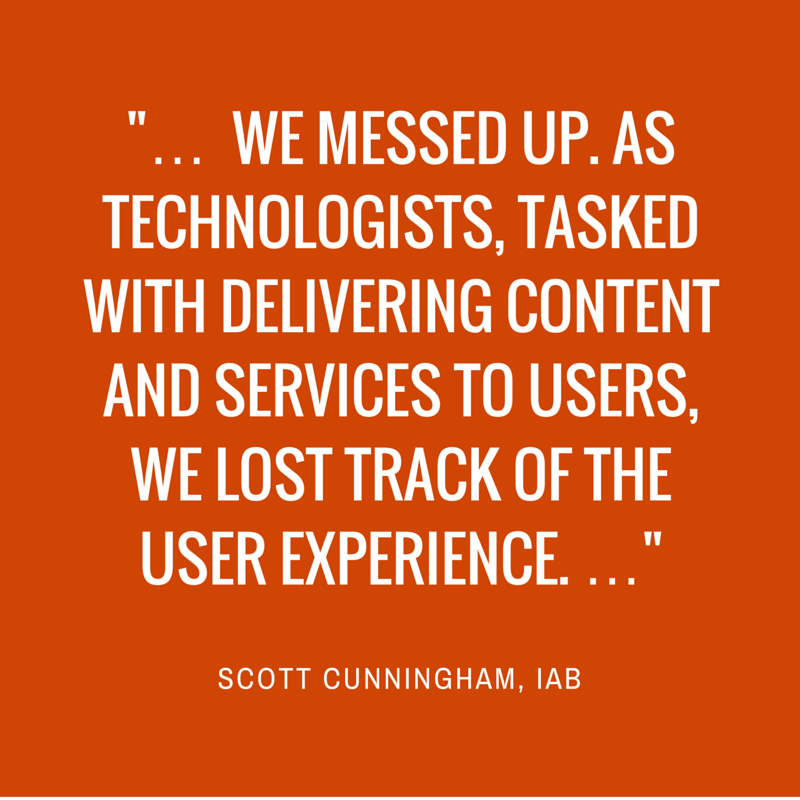 The iab’s Scott Cunningham mirrored sentiment from a number of industry executives that, in its rush to use new technologies to streamline and boost challenged advertising models, the industry lost sight of user experience and alienated consumers in the process. The iab also seemed to position itself and its members as protectors of the open Web and opposed to “an enclosed platform world dominated by a few companies”, likely a reference to companies like Facebook that offer a possible answer to ad blocking in their more closed publishing environments. It also outlined a new ad model which it called L.E.A.N which “stands for Light, Encrypted, Ad choice supported, Non-invasive ads”. L.E.A.N ads are not intended to replace current display ads but rather to offer an alternative option to its members. The iab didn’t release specifications for these L.E.A.N ads and rather invited comment with a view to developing industry standards to support L.E.A.N ad concepts. Another statement the iab made was that consumers may be targeted prior to making a purchase but not afterwards. This touches on consumers’ concerns that they are constantly tracked and presented with ads that have since become irrelevant and unwanted. As an industry approach, it is encouraging. The question is whether it will sufficiently address consumers concerns that prompted so many to start using ad blockers in the first place. It is also important not to overlook the value of alternatives to traditional banner ads. In-image ad products, like the products we have developed, are less obtrusive than your usual banner ad units and offer contextually relevant offers that are more likely to meet consumers’ needs. In the final part of this series, I’ll continue with a topic that is possibly the most important of all: what consumers want and why they use ad blockers in the first place? Understanding consumers’ concerns is key to developing a successful strategy. Thank you for reading our “Ad Blocker Strategies” article series. Contact us for more information about how we can help you build a successful strategy using more engaging and contextually relevant ad products. Subscribe to our mailing list for email updates from our blog!